Its Party Time! Guarantee success at your next gathering by surprising your pro-420 invitees with delicious Marijuana Leaf Candies. 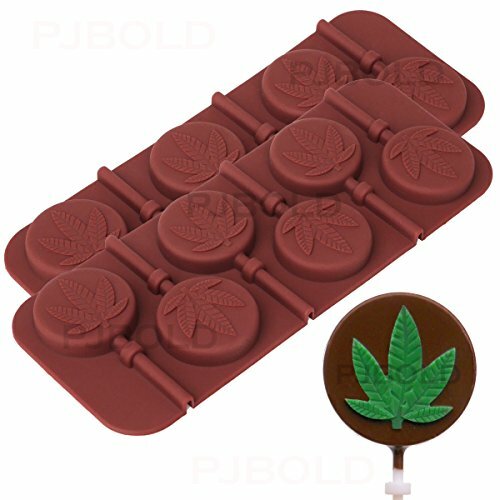 Our high quality Cannabis Candy Mold will make perfectly shaped marijuana leaf treats, sure to give your friends a chuckle, (or who knows make them giggle uncontrollably?) Youll be the most popular person at the party as you pass around the snack plate - especially when your special guests get the munchies. This professional high quality silicone mold is made of FDA standard quality silicone, is BPA free and non-toxic. Click Add to Cart now to start making your own Cannabis creations! PROFESSIONAL "high" quality design, non-toxic material used to create cool cake embellishments that look amazing and taste great! BPA FREE, food safe and FDA approved. Non-stick material allows for easy release and simple to clean. You can even put them in the dishwasher! YUMMY TREATS: Can be used for making cupcake toppers, chocolate snacks, hard candy, fondant, butter patties and other amazing creations. Can also be used in the freezer to make awesome ice cubes and popsicles. GREAT GIFT for that friend that has everything! Also great for making soap, candles, decorations and other crafts. SHARING: We donate a portion of all product sales to the Medical Cannabis Research Fund (MCRF) to help the those who suffer from cancer, chronic pain and debilitating health conditions. Federal funding for this type of research is nearly impossible to obtain. By purchasing this product, you are helping to support this very important research project. If you have any questions about this product by PJ Bold, contact us by completing and submitting the form below. If you are looking for a specif part number, please include it with your message.